As Opening Day draws near with each passing day, the IronBirds have been long into preparing for the 2019 season. The IronBirds are excited to announce three exclusive membership club experiences that are now available for purchase! The IronKids club presented by Maryland 529 is a must-join experience for any young fan coming to Leidos Field at Ripken Stadium. The club costs $15 per child and includes fun experiences throughout the entire season! Upon joining, each member receives one fan club t-shirt, one exclusive membership lanyard and one complimentary reserved box ticket to all five Sunday home games for the 2019 IronBirds season! Kids can also engage in a 2-hour baseball clinic led by IronBirds coaches and player personnel. Season long experiences give members the opportunity to be a part of the various pregame activities such as catch on the field, Q&A session with IronBirds players or venturing to autograph alley for an autograph from future Orioles! Every IronKid will also be able to participate in Kids Run the Bases after each Sunday game, storm out onto the field with IronBirds players as Co-Pilots prior towards the National Anthem and receive a season-long KidsZone wristband to give the best experience possible to the #1 fans in Minor League Baseball. The kids are not the only ones who get to have all the fun at Leidos Field at Ripken Stadium when summer rolls around. The LadyBirds Club is exclusively for the ladies out there who want to be more a part of the IronBirds fan experience. For $15, any lady can join and will immediately receive a fan club t-shirt and lanyard to commemorate joining. Similar to IronKids, LadyBirds will also receive a complimentary reserved box ticket to all five Sunday home games during the 2019 season. 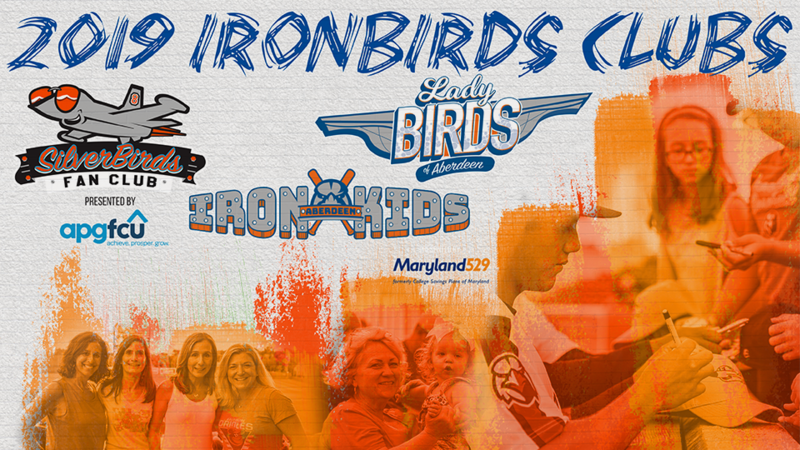 LadyBirds will have the opportunity to take part in various game experiences such as 3 Innings of Winning for each Sunday home game, a wine and paint night event to be held during an IronBird's home game with a complimentary glass of wine and new to the 2019 season is a picture with IronBirds players! A LadyBirds lanyard grants members Happy Hour from 3PM-4PM with the opportunity to purchase a $3 glass of wine at the Good Hops portable behind home plate. Raise your glasses this summer! 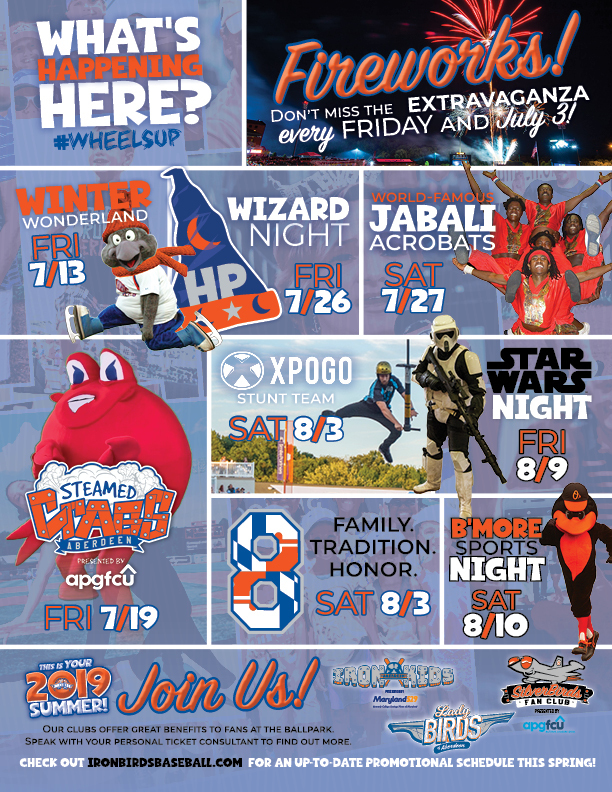 Our SilverBirds Club presented by APGFCU has seen some incredible additions for the 2019 season! For $15, the SilverBirds Club offers great value for a number of exclusive experiences. Joining the SilverBirds grants members a fan club t-shirt, a complementary reserved box ticket to all five Sunday games and an exclusive membership lanyard. In-game Baseball Bingo will be returning for the 2019 season, make sure you grab your bingo cards! Brand new for the SilverBirds club are three new experiences this season to accompany the Q&A session with the players and pregame catch on the field with a grandson or granddaughter. SilverBirds members can also look forward to the early bird experience of watching batting practice on the field, a tour of the club house and even snapping a picture with the players! These experiences can only be found at Leidos Field and Ripken Stadium this summer, #Wheels Up! Interested in joining one of our exclusive membership clubs? Click here to pick out the club that works for you!